It is the beginning of March, and I am longing for the milder winters of Scotland, as I look out at the white mounds of snow. I could be prepping my soil for planting right now, if I was there. With this being the worst winter in decades on this side of the Atlantic, it shall be a while before I see any young shoots. I suppose then this gives me time to plan out my garden. 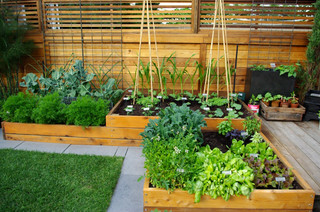 Winnipeg has a very short but HOT growing season due mostly to the continental climate on the prairies. Almost everything that I have grown in the past with ease in the UK proves to be a bit more of a challenge in this part of Canada. Its a learning curve, but I shall prevail! 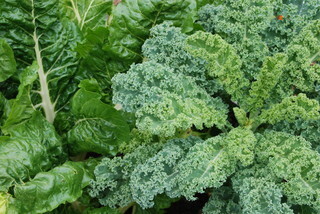 One of the my most rewarding gardening aspects is growing fruit and vegetables. There is just something to be said when you bite into a homegrown tomato, courgette (zucchini) or aubergine (eggplant). When one usually thinks of the kitchen garden, the idea of raised cedar planters resonate. The traditional style shown above has had a contemporary facelift. The sharp intersecting planes and different height boxes work really well. The contemporary feel extends to the stone mowing strip between the boxes and the grass. The different widths of stone adds visual interest by adding a different contrast from the long smooth linear timber. The mowing strip not only adds a different texture, but it is also time worth spent when you lessen your weekly navigation of the lawnmower and strimmer. The custom designed privacy screen is the icing on the cake, extending the cedar and the contemporary style beyond the boxes. On the complete opposite side of the design spectrum, a kitchen garden that is integrated into your overall garden theme. The image above does not show any vegetables, but just think of the idea of bringing your tomatoes and your marigold together. 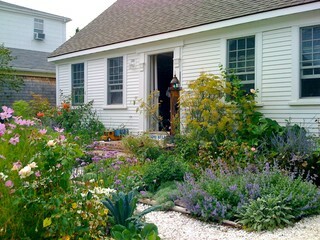 It is not only pretty, but the marigold help ward off the little pests and beasties that may damage all your hard work. There are many other companion planting pairings between herbs, flowers and vegetables that add a natural pest deterrent and a visual interest. A few other characterises that I am drawn to are that the beds are not too deep so there is easy access and there is lots of ground cover to reduce the soil drying as quickly. The latter is all dependant to your choice of plants and how you layer them. Lastly, the central vase could potentially be a rainwater collector (a wider lip would be preferable) and/or a surface rainwater runoff collector. The rainwater run-off flows through a series of inclined drains, beneath the decorative stones, that direct the water to a collection pit. This is perfect for conserving water for your plants. Even without the bells and whistles, If nothing else a piece of artwork and a few herbs would be a nice central focal point, well other than your prize winning pepper plant! So why don’t we stretch the idea even further. The lovely Cape Cod cottage pictured above has a whimsical note to the past that brings the potager garden to the front of the house. Who says you need a lawn? Even though the plants are placed in low lying symmetrical rectangular boxes, the array of vegetation brings a sense of playfulness. I love the mixing of textures; broad leaves of the rhubarb, tiny leaves and flowers of thyme, wispy fennel, curly kale and the list can go on. The great thing is that you can mix up the edibles and ornamentals every year. With a mind full of design possibilities and sketch paper and a pencil at the ready, I shall be scribbling away creating ideas for my garden. Well, until the snow melts!! Have fun dreaming of Spring! Categories: Outdoor spaces | Tags: backyard, cedar planks, Construction and Maintenance, contemporary, Country and Rustic, Design, Do it yourself, Home and Garden, Landscaping, potager, privacy fence, relaxation, small outdoor space, traditional, vegetable garden, Water feature | Permalink. The relaxed and effortless splendor of this outdoor space is truly sublime. The mature trees add a majestic backdrop to the sculptural aspects of the new landscaping. 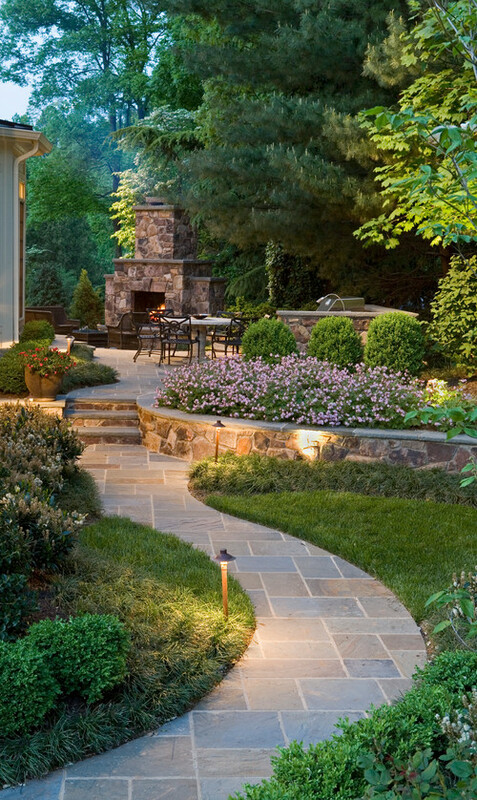 A sweeping Pennsylvania bluestone pathway is flanked by monochromatic ornamental mondo grasses and boxwood shrubs adding layers of opposing textures and visual interest. 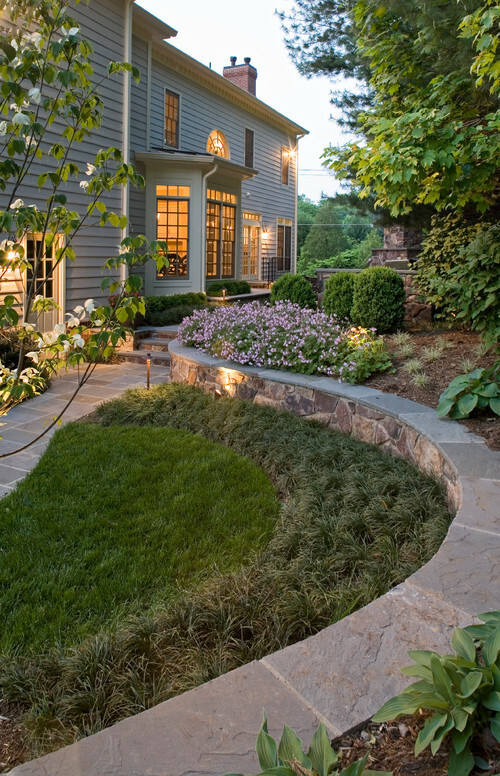 The understated path lighting serves a utilitarian purpose without distracting the viewer from the captivating horticultural layering of the landscape. A raised seating patio is anchored with a prominent robust outdoor fireplace and BBQ area. The patio features a curved rough cut stone retaining wall that adds a splash of colour through planting perennial purple geraniums. The low maintenance planting creates a ruffled or even a ripple effect as one’s eye moves from the smooth path towards the rough stone wall. The curvilinear arrangement of the landscape creates a peaceful repose. It encourages you to stop and inhale nature before heading on to where you were destined. What more can you ask for in a place for the grown-ups to unwind in such a beautiful setting. Categories: Outdoor spaces | Tags: backyard, bluestone, Construction and Maintenance, curvilinear, Design, Fireplace, Garden, Home and Garden, Landscaping, peaceful, retaining wall, stone pathway, texture planting | Permalink. This tiny little spaces packs a lot of character. 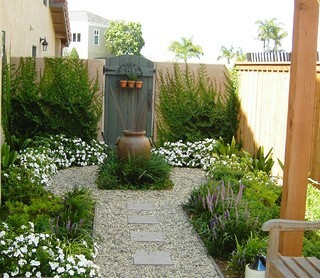 Kate Michels Landscape Design have the solution to the problem of how to treat that small backyard or side yard for that matter, that you didn’t know what to do with. The privacy fence is an articulate work of art. The decorative patterning is replicated on other vertical surface for continuity within the landscaping. The effect gives a café bistro ambiance right outside your back door. The antique table and chairs are size appropriate for the allotted area, enabling enough movement within the space. 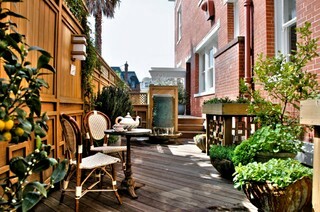 The decking is laid at 45 degrees that lends your eye to move throughout the space without creating a corridor. The space is not very wide but the direction that the deck boards are laid makes the area appear wider without foreshortening, as you would with horizontally laid boards. The concrete planters add a bit of visual bounce and softens the outdoor space with an array of greenery before focusing on the water feature at the far end. I think this is a terrific use of space that you could enjoy. This small area has become a relaxing retreat that may have, under any other circumstance, gone without notice. Categories: Outdoor spaces | Tags: backyard, California, decking, Garden, Home, Home improvement, Landscaping, Metro Areas, privacy fence, relaxation, small outdoor space, United States, Water feature | Permalink.